Welcome to my fan testing experiment. As many of you know, a fan operates and produces a curve that includes both pressure and flow rate almost exactly like a pump does. 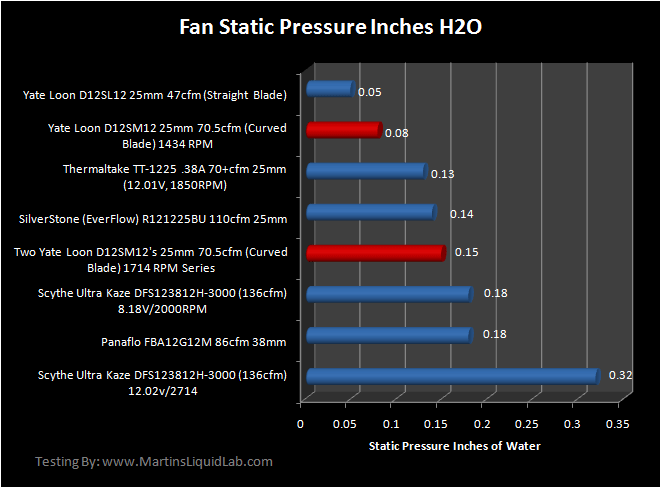 Unfortunately most fan manufacturers do not provide that fan curve, and a large majority don't even provide the static pressure specs. The air-flow spec you see is one that occurs when the fan is in open air without any restriction, so when mounted to a radiator of heatsink, the pressure resistance significantly impacts the amount of actual air flow just like water blocks do on a cooling loop. With the introduction of radiator thermal testing, I wanted to better understand fans at the same time and see if I could measure and capture some of these specifics around fan performance on a radiator. I would also like to give special thanks to Linus from NCIX.com for providing me with two sets of fans for testing. I selected to include both the Yate Loon D12SL12 slow speed 47cfm 120x25mm fans, as well as this Scythe Ultra Kaze DFS123812-3000 high speed 136cfm 120x38mm fans. Both present great value and a strong variety of cfm coverage for different setups. 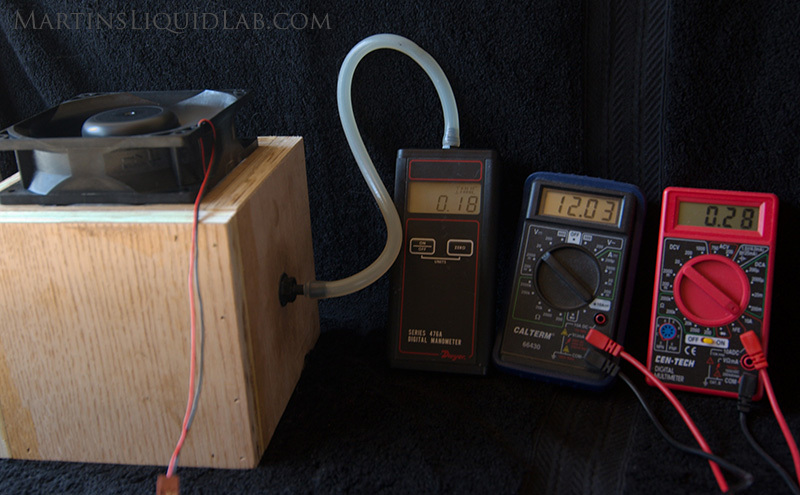 My first adventure started simple, I wanted to see if I could measure a fan's static pressure. First up was measuring against the one manufacturer that posts complete data, the Panaflo medium speed by panasonic. One thing that quickly became apparent was that my manometer the Dwyer 476A was not quite as sensetive as I had hoped. For some reason pressure measurements between -.10 to .10 want to read zero, so I had to force an error in the zero reading and do the math just to complete my static testing. In the end I decided to order another pressure guage. I ordered a Dwyer Magnahelic 2000-00 Differential Pressure Guage which is an extremly low pressure guage for measuring 0 to .25" water which is perfect for the medium to low speed fans. What is interesting to me is two things. First 38mm are far superior in pressure. The 86cfm panaflos and Ultra Kazes @ 2000 RPM have superior pressure over the SilverStone even though they operate at a lower RPM and have lower CFM ratings. 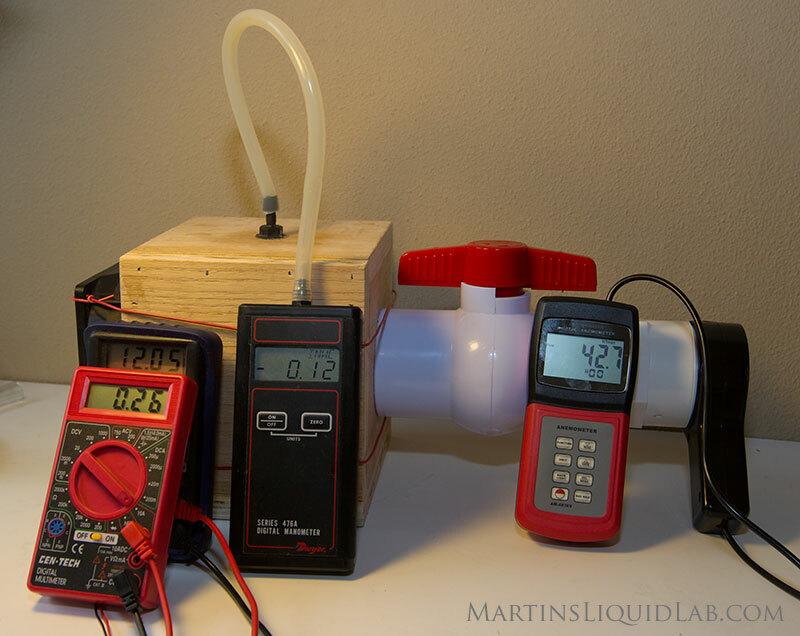 Second is I ran one experiment with stacking two Yate Loon medium speeds and nearly doubled the static pressure. This would indicate that stacking of 25mm fans is a good means to adding static pressure, and also that you're better off with some lower speed 38mm fans instead of 25mm types.